Brothers Luke and Clay, and their cousin Sally Jane, are embarking on another adventure near their Appalachian mountain home. After their last day of the school year, Sally Jane found the list of things they wanted to do that summer. When the old men at Holins’ General Store told them a story about a red-haired woman who had a frightening encounter with the Cherokees many years ago, the children decided to find the hidden pond where she supposedly drowned herself. They walked through the woods, and an eagle led them to the pond. What they found was both fearful and exciting. 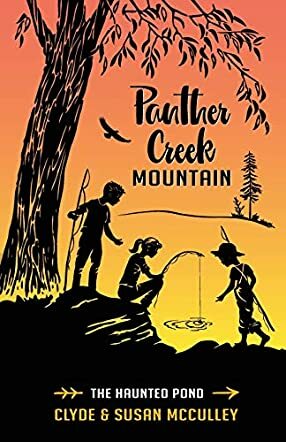 Panther Creek Mountain: The Haunted Pond, written by Clyde and Susan McCulley, is a delightful adventure capturing the spirit of the mountains, family life and childhood imagination. The authors have included some details teaching children to understand how life was different in the mountains in the 1950s. These include having wild huckleberry pie, riding in the back of a pickup truck and going to the local hardware store to watch The Today Show on the television. The story is written in a clear, concise manner and will easily hold the attention of young children. The aspects of having panthers screaming every night, and spirit animals, will certainly pique their interest in these topics. Authors Clyde and Susan McCulley have written of a past time, teaching children about a possibly unknown period and culture in Panther Creek Mountain: The Haunted Pond. This is the second book in a series, and the next one is on the way. A good story.